The conference sessions might not give you a very in-depth learning experience on the topics. To address this issue, we plan to host 5-8 workshops before the conference by our expert international speakers. This will help you get the insights directly from the experts. These workshops will be announced by Mid Nov. Under this theme, practical experience and expert presentations focusing on adopting Agile & Lean mindset in organizations of all types and sizes, scaling from single team doing agile to multiple teams, departments and non IT adoption of agile practices. Topics related to changes in organizational structure & policies, auditing process & metrics collected and how performance management is performed will be covered. Under this theme, practical experience and expert presentations focusing on the entire lifecycle of a project/product starting from product discovery, MVP, project kickoff, release planning, user story mapping, Agile UX, development & testing practices, CI pipelines from development to deployment, DevOPs, Usage Analytics, A/B testing and beyond. Similar to the Pre-Workshops, we'll also host some workshops post the conference. Details will be announced by Mid Nov. Experience Report authors have to write a 2-3 page report about their experience. Case study authors have to write a 5-6 page report about the experience. Like at Agile India 2014, we'll help the authors to write and publish these reports. They'll be available to all participants. The conference sessions might not give you a very in-depth learning experience on the topics. To address this issue, we've planned the following workshops before the conference by our expert international speakers. This will help you get the insights directly from the experts. Similar to the pre-conference workshops, we'll host the following workshops post the conference. 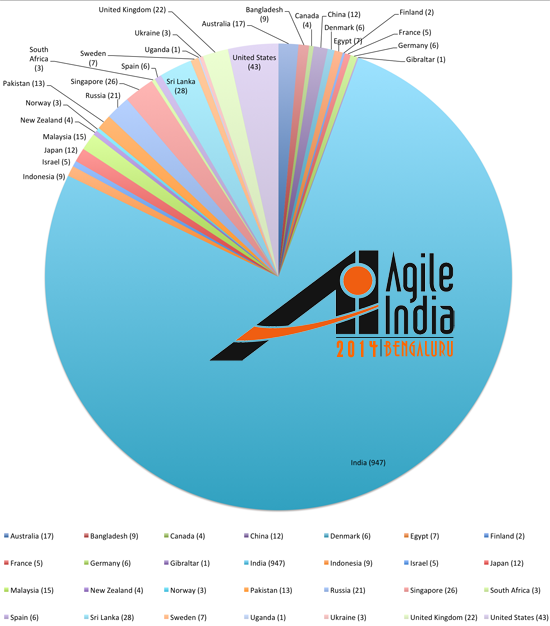 Agile India 2014 Conference was happy to host 1236 Attendees from 28 different countries. The attendees belong to 226 different companies and play 342 different roles. 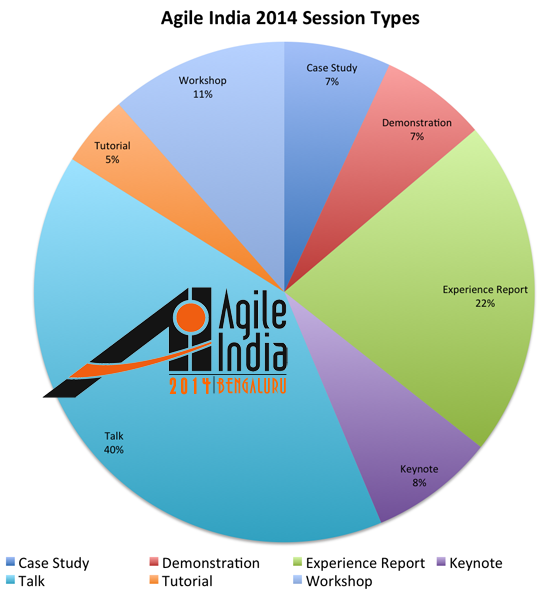 For detailed stats refer to Agile India 2014 Delegate Profile. 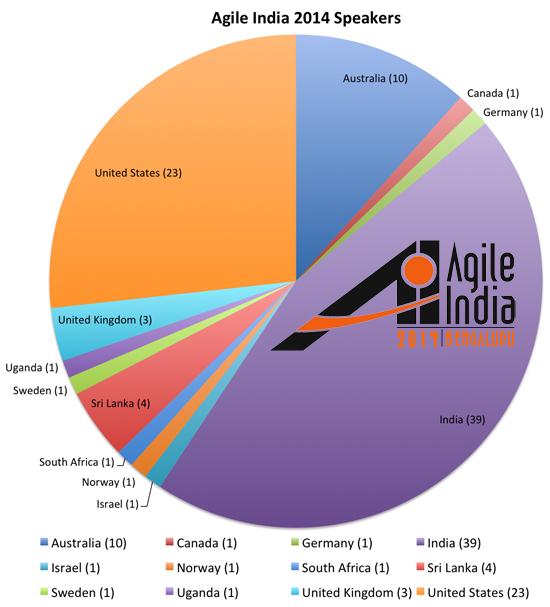 Agile India 2013 Conference hosted a total of 904 attendees from 25 different countries over the 4 days. These attendees has 320 unique roles representing 195 different companies. 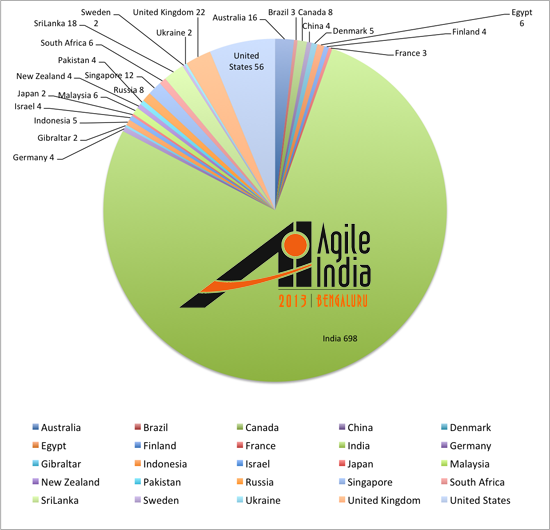 For detailed stats refer to Agile India 2013 Delegate Profile. 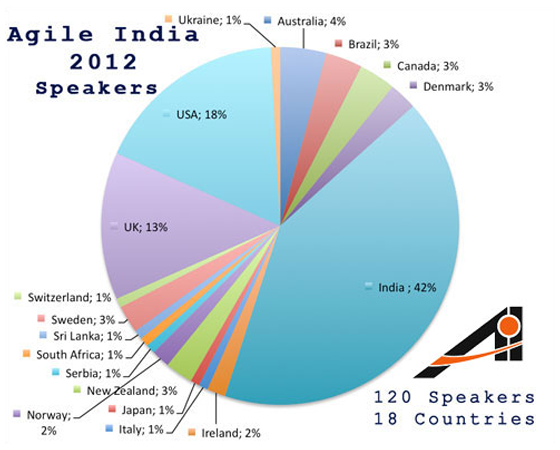 The Agile India 2012 Conference was fully SOLD OUT. We have 750 delegates from 21 Countries attending the conference with 337 unique Roles from 228 different Companies. 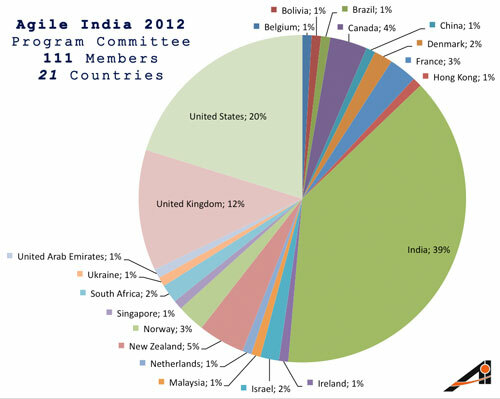 For detailed stats refer to Agile India 2012 Delegate Profile. J.P. Morgan is more than a leader in financial services that has been offering solutions to clients in more than 100 countries over the past 200 years; it's also a formidable Technology force in its own right. Every part of our business is empowered and enhanced by the sharp thinking of our Technologists. It's a vibrant place, constantly seeking innovation. Backed by multi US billion $ spend in technology last year alone, J.P. Morgan is on a journey of continuous innovation, championed by senior leaders from around the firm. Our technological innovations include: Athena, Compute BackBone, Field Programmable Gate Arrays (FPGAs) and etc. We are a firm that's not just dedicated by technology, but defined it. We seek out the best technologists and give them access to career-enhancing projects that have high investment, high impact and global reach. The work is varied, incredibly fast-paced and set in an environment that evolves as quickly as business opportunities present themselves. To learn more about us, visit jpmorgan.com. An end-to-end Agile Software Development Solution Provider and Consultancy, having expertise of thousands of consulting hours in Agile, Kanban, Scrum, SAFe and Lean Start-ups ways of working. We provide Education, Skill Transfer & Mentoring services to our customers to "Create Things of Great Value" by growing their People, Operations and Business Agility. 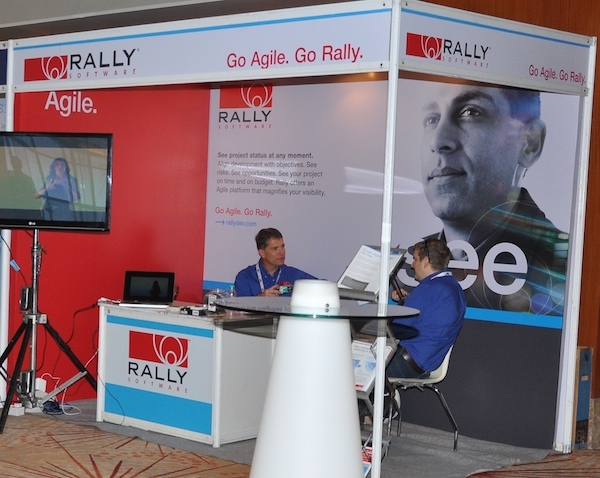 We are partnered with Rally and guide customers organizing with RallyDev, and being bronze partners of Scaled Agile Academy, we help customers scale with Scaled Agile Framework. In our endeavour to provide sustainable learning we provide Training, Certification and Coaching on Lean - Agile, Scrum, SAFe and DevOps. QAI is a global workforce development and consulting organization. Established in Orlando, USA in 1980, it has a global footprint with presence in India, USA, China, Malaysia, Singapore and Dubai. QAI addresses the education and operational excellence needs of IT, IT-Enabled and knowledge-intensive organizations through its two divisions- QAI Global Services and QAI Global Institute. QAI's Agile Center of Excellence provides a range of Agile services including- Competency Development, Piloting Agile, Agility Assessments, Agile Transformation and Custom Agile Solutions. A Certified Scrum Alliance and PMI REP, QAI offers a suite of Agile trainings including- CSM, CSPO, PMI-ACP, SAFe and KANBAN. Perforce is the most scalable, fast, secure and reliable enterprise version management technology platform that increases productivity, improves software quality, and helps reduce the complexity of global environments for individual and enterprise projects. Perforce is Hybrid version control with the capability to version everything and also helps in code collaboration and document collaboration while providing the analytics about your project. Lyra Infosystems has established itself as a trusted and authorized business partner in Indian subcontinent for Perforce Software. Our expertise in helping to create better software to the enterprises reflects our clientele. We are headquartered in Bangalore and have offices in Mumbai, Gurgoan and Singapore. Digité is a Silicon Valley based Pioneer in the Lean/ Agile Software Development, Program & Project Management and Application Lifecycle Management. Digité's products SwiftALM, SwiftKanban and SwiftSync are leading-edge Cloud based products that enable globally distributed organizations to Collaborate both internally and with external customers to Successfully deliver Consulting and IT Services, Software Applications and Products while boosting Personal Productivity and Quality! Digité has over 300,000 active users worldwide. All Digité solutions are available as SaaS and On-Premise Solutions. Become part of something bigger than you alone. With over 300,000 members world-wide, Scrum Alliance brings you together with like-minded people who are passionate about Scrum and who dream, explore - and live - project management brilliance every day. 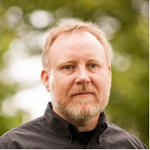 A nonprofit professional organization, we provide advocacy, community, and education to support this movement, equip our members, and help them succeed with Scrum in software development and beyond. Come sprint with us! Scrum is an ongoing journey. And it's important to surround yourself with the best minds, ideas and advice along the way. Find all this and more at Scrum Alliance, the place to learn and talk about Scrum. Become part of our Scrum Community for free as a SCRUM ALLIANCE® Basic Member. Crest Technology has the vision to build the state-of-the-art leading publishing platform which fosters communication among scientific and professional communities. We are essentially a team of agile, passionate hard-core techies who love challenges and creating disruptive products & solutions that revolutionize the global market-place. We love to code and do cool things. Our teams are young, dynamic and creative. They are free to spend 10% of their work-time on learning & trying out the latest cool tech stuff. Flat hierarchy, transparent communication and open work-spaces are some of the distinctive features of Crest culture. ICAgile – the International Consortium for Agile– is an independent accrediting agency dedicated to advancing the state of agile learning worldwide. ICAgile's primary focus is providing a learning journey for individuals on the path to agile mastery through an array of competency-based expert certifications based on the ICAgile Learning Roadmap. The ICAgile Learning Roadmap has been developed by over 30 experts and practitioners world-wide and contains over 400 learning objectives across various agile disciplines. LEARNING IS THE PRODUCT. CERTIFICATION IS THE BY PRODUCT. Training providers, corporations, academic institutes and government entities can offer over 10 different knowledge-based agile certifications after successfully accredited their learning experiences, regardless of which methodology or framework they are using or teaching. Allscripts (NASDAQ: MDRX) is a leading provider of Healthcare IT solutions that advance clinical, financial and operational results. Allscripts has more than 6,000 associates across the globe, including more than 2,000 associates in three India offices- Pune, Bengaluru and Vadodara. 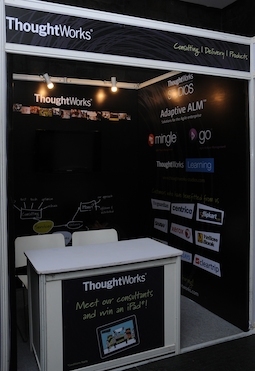 ThoughtWorks is a global company of passionate technologists. We specialize in disruptive thinking, cutting-edge technology, and a hard-line focus on delivery. Our clients have ambitious missions to change their industry, their government, and their society. We provide software design and delivery, pioneering tools and consulting to help them succeed. 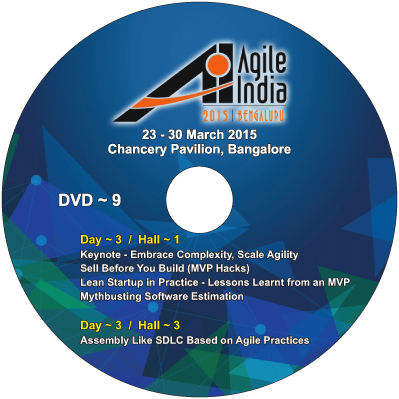 Over the last 10 years, the Agile Software Community of India (ASCI) has organized 50+ conferences in various cities of India. After the grand success of Agile India 2014, Agile India 2013 and Agile India 2012 conferences, and with your support, we are all set to organize a much larger conference, the biggest Agile and Lean conference in Asia ever! Take advantage of this unique opportunity to market your company, products and services to the most influential people defining and leveraging agile software development practices today. We offer many sponsorship levels with excellent marketing opportunities and benefits within each category. 10 Approval for Bag Inserts (Literature or SWAG) - All sponsors need approval before sending the material to us. Mar 10th Please email naresh@agileindia.org the scanned copy. Agile FAQs Technology Pvt. Ltd.
12 Fully formatted email message to be sent to all the participants. Stalls will be operation from 9:00 AM to 6:00 PM on March 25th, 26th, 27th & 28th. Note: Your stalls will be setup on March 24th late night (11:00 PM onwards) and will be handed over to you on March 25th 7:30 AM for any additional setup. 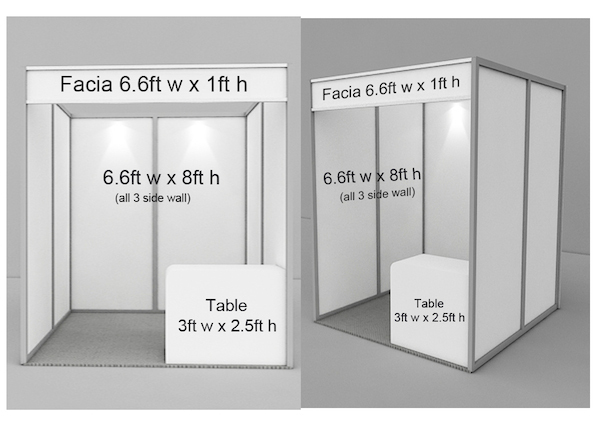 As part of the sponsorship, the conference will be giving a plain Octanorm stall with 2 spot lights, one table and 2 chairs. Contact Mr. Harish at sasihari@gmail.com for more details about the stalls. Thank you for all the wonderful proposals. Now, we've the final schedule announced and we are not accepting any more proposals. There are 2 broad categories (Scaling Agile Adoption and Agile Lifecycle) under which you can submit your proposals. Please check Conference Theme page for details on the themes and session formats. Interested speakers are requested to submit their proposals directly on our proposal submission system. All proposals will be public. Registered user of the submission system will be able to comment on your proposal. You are required to reply to those comments to provide clarifications, explain revisions and respond to questions. The program team will look at how well you've responded to comments and updated your proposal to incorporate public suggestions. Ultimately the decision to accept a session resides with the program team. To encourage early submissions and iterative improvement of proposals, we'll start accepting proposals as soon as we find them a good fit. As time passes by, the competition gets tougher. So don't wait till the last to submit your proposal. Balance - We want to strike a good balance between different types of presentations (expert talks, experience reports, tutorials, workshops, etc.) and different types of experience the speakers bring to the conference. Equality - We encourage more students and women speakers. We won't select any proposal just because it came from a student or a female speaker. But given we have to pick 1 out of 2 equal proposal, we'll pick the one, which was proposed by a student or a female speaker. Practicality - People come to a conference to learn, network, have an experience and leave motivated. Proposals which directly help this are always preferred. While a little bit of theory is good, but if the proposal lacks practical application, it does not really help the participants. Also people learn more by doing rather than listening. If proposals has an element of "learn by doing" it wins over other proposals. Take people on a learning journey. Originality - Original ideas wins hands-on from copied one. People always prefer listing to an idea from its creator rather than second or third person. However, you might have taken an idea and tweaked it in your context. You would have gained an insight by doing so. And certainly all of us want to hear your first-hand experience, even though you were not the creator of the original idea. We are looking for Thought-Leadership. Radical Ideas - We really respect people, who want to push the boundaries and challenge the status quo. We have a soft-corner for unconventional ideas and will try our best to support them and bring awareness to their work. Is the Title matching the Abstract? Under the Outline/Structure of the Session, will the time break-up for each sub-topic will do justice to the topic? Is there a logical sequencing/progression of the topics? Has the speaker selected the right session type and duration for the topic? For Ex: 60 mins talk might be very boring. Has the speaker selected the best matching Theme/Topic/Category for the proposal? Is the Target Audience specific and correct? Also does it match with the Session Level? Is the Learning Outcome clearly articulated? Ideally 3-5 points, one on each line. Based on the Outline/Structure, will the speaker be able to achieve the Learning Outcomes? Based on the presentation link, does the speaker have good quality content and good way to present it? Based on the video link, does the speaker have a good presentation (edutainment) skills? Will the speaker be able to hold the attention of a large audience? Based on the additional links, does the speaker have subject matter expertise and thought leadership on the proposed topic? When selecting a proposal, we pay attention not only to the quality of the proposal, but also quality of the speaker, .i.e. whether the speaker will be able to effectively present/share their knowledge with others. Hence past speaking experience (videos & slides) are extremely important. If you don't have a video from past conference presentation, that's fine. Try to setup google hangout in one of your upcoming local user group meeting or internal office meeting, where you are presenting and share that link. This will give the committee a feel for your presentation skills and subject matter expertise. 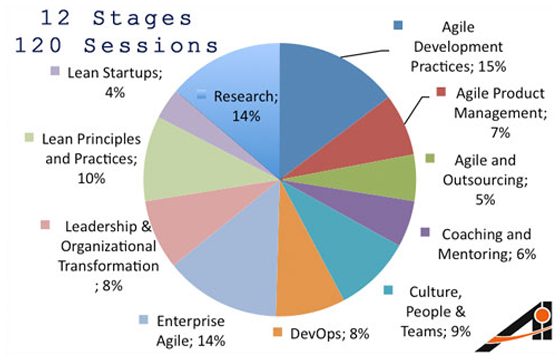 Contact sales@agilefaqs.com for discount code for the other conference days. Compensation listed above is only for primary speakers. Co-presenters can avail a 50% discount on their registrations. Hotel nights are capped at 4 nights for speakers with multiple accepted sessions. They cannot be accumulated beyond the cap or transferred to another person. Free registrations cannot be accumulated or transferred. Make sure you've read the following guidelines carefully. 1. Summary. The summary must sell and exude excitement. 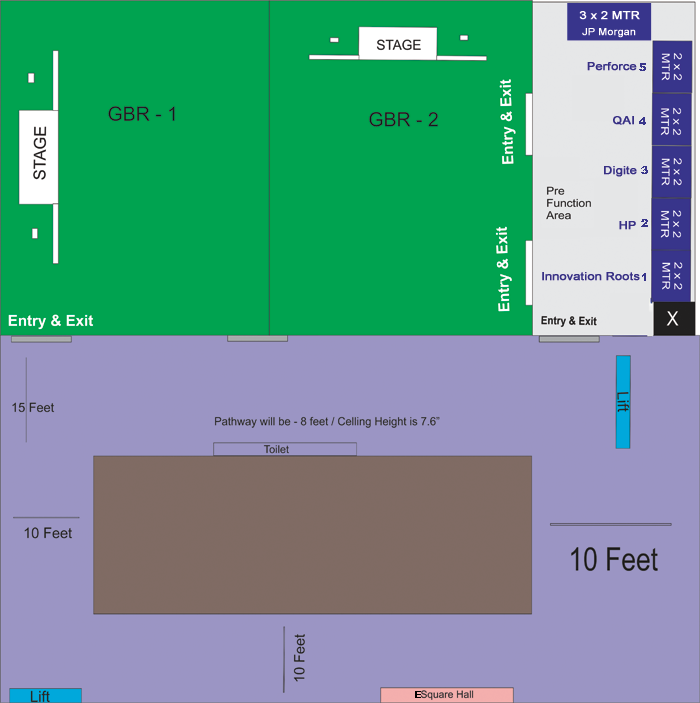 Since its the only thing the attendees will see, it needs to pull them into your session instead of the 15 others they can visit at the same time. The attendees should be able to show the abstract to their manager/team and have them understand the value of the session. 2. Catchy title. A catchy title may help to build stronger mental model and focus the session's abstract better. Watch out for catchy becoming corny, though. 3. Sell yourself. The reviewers should have confidence that you are a good presenter and that you will be successful at facilitating the session. Don't assume you can cruise on your reputation, not all the reviewers will know you well enough to judge. Include a link to other material/web sites that may help you to sell yourself. 4. Prior experience with session. Share experiences giving the session. 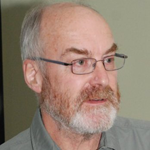 Links to slides, videos or people's blog about those sessions. If you're planning to do a test run at the local user group, mention that - it makes a big difference as far as a reviewers' confidence about the quality of delivery is concerned. 5. Co-presenters. For long presentations 90 minutes a second presenter is really a good idea. After about 5-10 (max 20) minutes of hearing someone's voice you become habituated and tune out. Switching presenters delays that. 7. Have a plan. At least a minimal plan is necessary so the reviewer will have an idea how you will spend your limited time budget. The longer a session you want the more details you need to provide. 8. Clarity. Make a clear statement of what the attendees will do or expect. Sometimes proposers can err too much on the side of selling their ideas in a catchy way that exactly what will be done in the session is not clear. 9. Clear learning objective. State how will their lives of attendees will be better, more effective, more enjoyable as a result of attending. 10. Slides/Video. 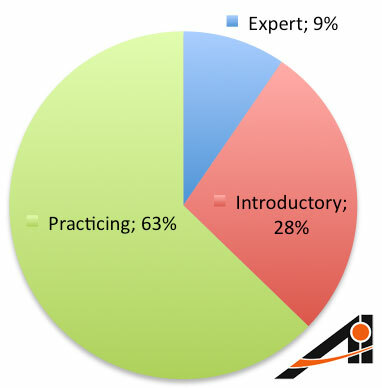 While the topic is important, the presenters' presentation style and past experience presenting is equally important. For the program committee to understand speaker's presentation skills, providing slides and video links is extremely important. It is possible that you don't have slides/video of the topic you are proposing. That's fine. At least provide links to something you've presented in the past. 11. Enjoyment. Make the reviewer feel the attendees will enjoy themselves during the session. At best, they should learn specific concepts, skills, principles, approaches, frameworks. The amount of material taken away should not be overwhelming. As one reviewer said, "At the end of the day, what I'm looking for is something that gets my juices flowing and makes me want to fight for a place in the session." 12. Questions. It may be appropriate to pose questions to the reviewers and gives us options for adjusting the proposal. 13. Language. Use active verbs, not passive language. Bad: "This session allows you to learn..."
Bad: words like "might", "could", "intent"
Good: words/phrases like "master", "learn", "experience", "do", "participate"
Not "You can participate", but "As you participate, you learn..."
14. For Experience Reports and Case Studies, background context is essential. Tell us what the story arc of the experience is, some lessons learned, some challenges. Tell us whether you have empirical evidence or anecdotal experience. Hotel Chancery Pavilion, a 5 Star Luxury Business Hotel, located in the heart of the city. We've worked out a special discounted price of 4500 INR + Taxes for Superior Room. 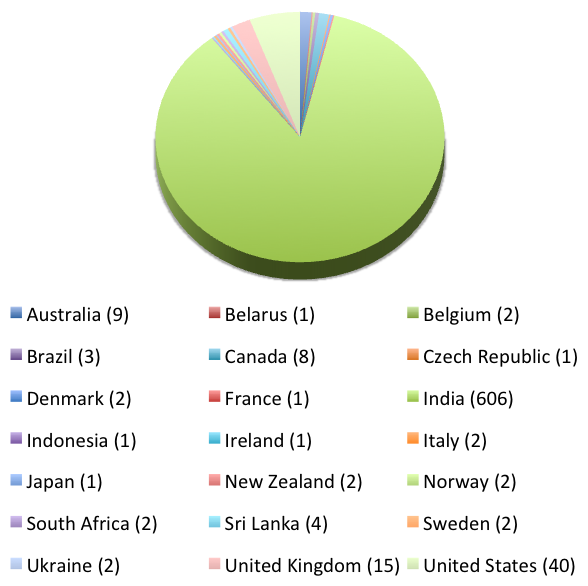 Australia, Brazil, Cambodia, Cook Islands, Djibouti, Fiji, Finland, Germany, Indonesia, Israel, Japan, Jordan, Kenya, Kiribati, Laos, Luxembourg, Marshall Islands, Mauritius, Mexico, Micronesia, Myanmar, Nauru, New Zealand, Niue Island, Norway, Oman, Palau, Palestine, Papua New Guinea, Philippines, Republic of Korea, Russia, Samoa, Singapore, Solomon Islands,Thailand, Tonga, Tuvalu, UAE, Ukraine, USA, Vanuatu, Vietnam. We recommend all foreign delegates (speakers & participants) apply for this visa. This is the safest, cheapest and most hassle-free visa. Citizens from other countries are required to apply for the visa before hand. Give at least 3 weeks for the visa process. Please do not apply for Conference Visa. This visa is only applicable for government run conferences. Want to help the Conference? Join the Review/Program Team: Typically, we select the review and program team via a public call for volunteers. However this year, we would like to try a new model. Click the "Join Review/Program Team" link on the left menu for more details. Submit Proposals: We would love to hear your first-hand experience with Agile & Lean methods. 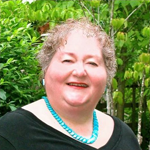 Why don't you consider submitting a proposal to share your experience on a specific topic? We look forward to some great proposals from you. Encourage Others to Submit Proposals: If you know an agile practitioner/expert, with good presentation skills and deep insights, please encourage them to submit a proposal. Register for the Conference: While the conference program is important, the conference delegates are equally important. Our International Speakers from past conferences, have consistently praised the quality of participants we are able to attract at the Agile India conference. The quality of interactions/questions have been extremely good. We want to push the bar further up. Spread the Word: For the last 10 years, Agile India conferences have thrived on Word-Of-Mouth publicity. Your help is greatly appreciated. Click the "Spread the Word" link on the left menu for more details on how you can help. 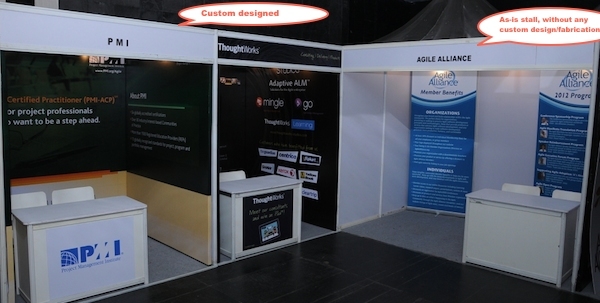 Sponsor: Right from the beginning (2005), Agile India has always been community-run, non-profit event. We rely on corporate sponsorship to keep ticket prices low for attendees, cover the cost of flying international speakers, as well as cover the cost of venue, food, beverages, t-shirts, and more. Checkout how to become a sponsor. The Conference Program is the heart of the conference and we really need your help to put together a rock-solid program. Review team is responsible for giving feedback to the speakers to improve their proposal. The goal of the review team is to improve the overall quality of the proposal via continuous review. Program team is responsible for selecting the proposals and putting together the schedule for the conference. The goal of the program team is to ensure conference program exceeds delegate's expectations. Typically, we select the review and program team via a public call for volunteers. However this year, we'll not select a team to start with. Instead we'll select these teams based on actual contributions. Depending on your contributions in the submission system, you'll automatically get selected as a reviewer by the system. If you consistently contribute as a reviewer, you'll get selected as a program team members. We've believe in a merit based system where everyone gets a fair chance. Look forward to your participation. Is the Learning Outcome clearly articulated? Ideally 3-5 points, one of each line. While you are looking at the proposals, please leave suggestions for the speaker to improve their proposal. In some cases, you might need to ask clarifying questions to truly understand the proposal. This would help the speaker refine their proposal. Eventually, this would lead to a much higher quality presentations. If you like the proposal and want to make sure it gets selected for the conference program, then please vote for the proposal. Your vote matters! What can you do to spread the word? Regularly communicate (Tweet/Email/Blog) about the updates from the conference. This will help people in your network get interested in the conference. Please use @agileindia handle & #AgileIndia2015 hashtags in your tweets. If you are active on certainly mailing lists, user forums, meetups, etc. please inform people about the conference. Share the conference overview presentation within your office/network. Love to hear from you about any other ideas or suggestions you might have. For the past 10 years, to help grow a sustainable software community, we've organized over 50 conferences world-wide. AgileFAQs was founded by Naresh Jain to help organizations embrace, scale and sustain essential Agile and Lean thinking. 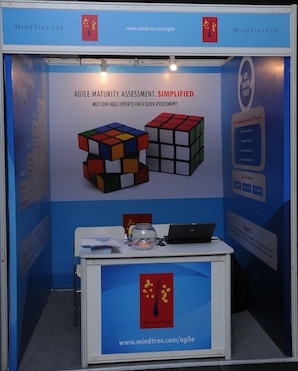 Checkout the various conferences that we've organised so far at http://agilefaqs.com/initiatives/conferences. Agile Software Community of India (ASCI) is a registered society founded by a group of agile enthusiasts and practitioners from companies that practice Agile Software Development methodologies. ASCI is formed to create a platform for people from different software organizations to come together and share their experience with Software development methodologies. 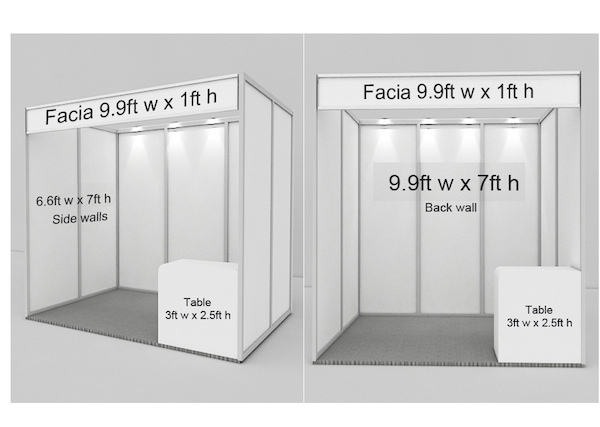 ASCI's focus is Agile and related light weight methodologies/philosophies. ASCI evangelizes itself to be a facilitating body which fosters and innovates lightweight methodologies in software development in India. ASCI is working with Universities and Student chapters to increase Agile awareness within the academic circles. Quality OVER Quantity: At Agile India, we believe in staying small and providing a richer experience to the participants. Its never about how many talks we can jam into the program or how many participants we can gather. Its about building a strong, sustainable community. Zero Marketing: You cannot pay to get a speaking slot. Conference talks are never sold to sponsors. Respect Privacy:The conference participant database is never sold or given to sponsors. We respect and protect your privacy. Equal Platform: Right from 2004, Agile India has maintained an independent/neural stand when it comes to various Agile Methods, Tools, Certifications, etc. At Agile India, each of us might have our preferences, but we ensure we provide an equal opportunity to everyone who want to present at the conference. Moderately Priced: At Agile India we strive really hard to make the conference affordable. Our aim is to ensure that interested participants should be able pay out of their pocket, without having to depend on their company for sponsorship. Networking: At Agile India you will learn as much (if not more) by meeting other practitioners, making connections with them, sharing your ideas, and building a strong community.